- Ghosh Lineage Beginning yoga is a serious cardiovascular work out! -Your body burns fat more effectively when it is warm. Body fat is quickly redistributed and burned as energy during the class. - Your elevated metabolism speeds up the breakdown of glucose and fatty acids. - Beginning practitioners have been known to lose anywhere from 1/2 kilogram to 2 kilograms per class as your body naturally rids itself of excess weight to find a healthier equilibrium. - The heat and vigorous exercise causes your capillaries to dilate bringing oxygen more efficiently into the tissues, muscles, glands and organs and helping in the expelling of waste. - Your skin is your body's largest waste disposal organ and yoga practice allows you to remove toxins and waste through the massive amounts of sweat pouring out of your pores during a 90 minute or 60 minute session. - The "tourniquet effect," the squeezing and releasing of your internal organs and glands, sends fresh blood to these areas allowing them to function the way they were meant to and remove the toxic buildup of waste you have accumulated in daily life. It also regulates your hormonal balance. - Our state-of-the-art far infrared heating system warms objects instead of the air as in conventional heating apparatuses. As a result the air does not lose oxygenation as in gas-heating and a more thorough and gentle warming effect is achieved. For more information about infrared heating, watch this video. - Practicing stretching in a heated room allows you to relax fully into the poses and let your joints naturally stretch. The heat produces a much easier stretch because warm muscles are suppler and more malleable, therefore allowing for greater range of movement in joints, muscles, ligaments and other structures in the body. - Muscles and connective tissue become more elastic and allow for greater flexibility with less chance of injury and improved resolution of injury. - Unlike some yoga styles, Ghosh yoga postures are held for longer periods of time building your muscle strength and endurance. - Ghosh Lineage Beginning yoga is challenging and requires patience, concentration and willpower. The skills you build during a class will transfer to all areas of your life-- your health, relationships, career, -- and enhance your general sense of wellbeing and confidence. 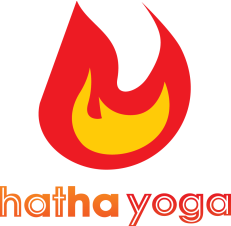 - "Hatha " means the forceful union of body and mind. A 90 minute or 60 minute class yolks you into a more intimate understanding of body and mind and helps you more clearly recognize who you really are. Click here if it is your first time trying Ghosh Lineage yoga.